Study notes for most subject are pretty simple; condense what you’ve studied in class, add a few formula sheets or related texts and you’re done. Visual Arts tends to be an outlier in this, because the HSC Visual Arts study notes you have to write are totally different and usually pretty hard to figure out! Do you write about your major work? Work you’ve done in class? Which painting style you like most? Luckily we’ve compiled an awesome ‘how to’ to guide you through just what should be included in your HSC visual arts study notes and how. So keep reading and get ready to smash out some super HSC visual arts study notes! By now you will have heard about these concepts heaps, especially the frames which you will have studied since year ten. They’re both super important to include in your study notes because these are ultimately what you use to analyse and understand all artworks! The frames define what an artwork is and what it shows. They basically give you a ‘frame’ through which to look at an artwork and make assumptions, draw connections and respond to the work. This is how you pull out key features of an artwork to comment on when you’re analysing it. The conceptual framework is a little trickier, but it’s basically a formula for figuring out how an artwork relates to everything around it. For each section on the mind map (artist, audience, world) you must ask yourself, ‘How has this influenced the artwork?’ and ‘How does the artwork respond to this?’. It can be confusing at first, but over time thinking about artworks through this framework becomes almost second nature! You want to have these two concepts (in a table, mind map or dot point form) at the very beginning of your study notes – the first page of your book or digital notes. This is for two reasons; one, you want to be looking at them frequently in order to keep them fresh in your mind when doing visual arts study, and two, you want them somewhere that’s easy to find and jump to quickly. By having these right at the beginning of your notes you make it much easier to move forward productively and remember just what you should be thinking about whenever you’re studying for visual arts. Art is a pretty vast world with a lot of technical terms, from painting styles to obscure artists and eras. You’re absolutely guaranteed to come across words you don’t know or understand while studying visual arts (chiaroscuro anyone? ), which is why it’s important to build up your vocabulary while you study. 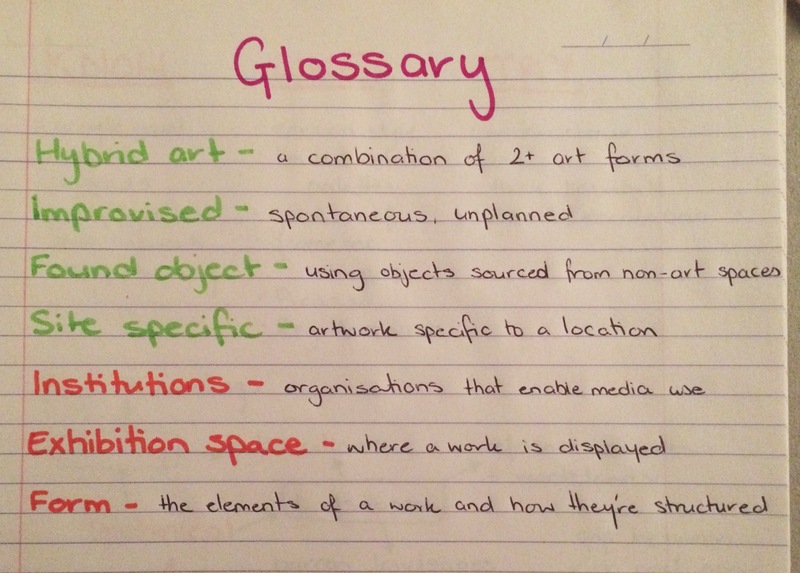 Creating a glossary at the end of your study notes therefore makes it easy to start creating a word bank of technical terminology and phrases to remember and use in later work. Of course you don’t need to restrict yourself to only including words you don’t know – any word you come across that you think could come in handy is fair game for your glossary! Over the course of the year you’ll likely build up an expansive glossary that you can continue to refer back to when studying or writing essays. If you find that your glossary is becoming too long or you’ve learned most of the words by heart you can always just remove the glossary and create a new one focussing only on the words you’re still not 100% on! In the end a page of your glossary should look a little something like this. It’s good to use colours to create visual interest, and you can also colour code terms to show which relate to art styles, which are artists and which are just general terms! Now it’s time to start filling up the space between step one and step two with study notes! Throughout the year you’ll be studying different topics in your visual arts class and while most of these will involve practical art making, the theory work is also super important! Each topic will most likely focus on a specific artist, art period or art style, making it really easy to group your study notes by topic. 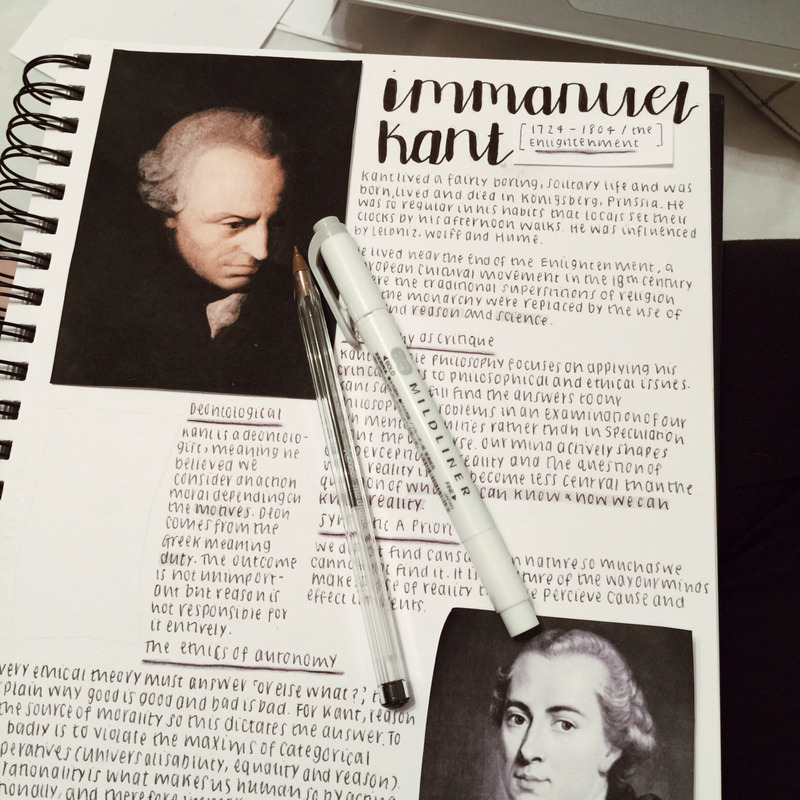 The best way to develop study notes for each topic is WAYG – Write As You Go. This doesn’t mean coming home every day and adding to your notes (though you can do that if you like! ), rather it means that every time you cover new information you condense it in your study notes. Most people prefer to do this at the end of each week, as it makes it really easy to keep up to date with your notes and prevents you from having to write too much. Some people prefer to do it fortnightly, or at the end of each topic, but that can lead to lots of work building up which makes writing your study notes a larger task. When it comes to actually writing notes you want to be condensing the ideas and concepts studied in class and expanding on artists and artworks (which we’ll talk about in the next steps). For condensing class work mind maps, dot points and flow charts are the best way to go, as they force you to be concise but also allow you to show how different ideas relate. If you’re looking at a specific art era or art history in general you may also use timelines to show when certain events/artworks/artists were relevant. Remember that this is visual arts, so including images, diagrams, drawings, sketches, etc. is 100% recommended. If it’s an example artwork you’ve studied or just to remind you of a certain idea, visual note taking is always awesome! 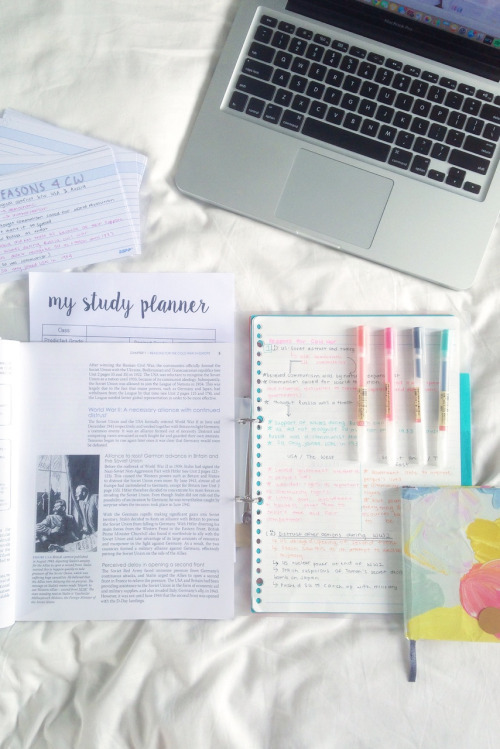 For more ideas on how to set out some aesthetically awesome study notes check out study blogs like these. When it comes to studying specific artists you need to go a little more in-depth than your regular topic study, as you’ll need to know artists well enough to write about them in detail for your essays. Fortunately there’s an easy way to break down exactly what you should be looking at and thinking about while wiring study notes for any artist. Context – who they were, what years they lived, their society, etc. Ideas/issues – what did they make art about, why was this important to them? Conceptual framework – how did they feel about their art, their audience and the world around them? Together these four headings will cover all the different topics, ideas and information you may want or need to write about in an essay. They allow you to get a better understanding of the artist, who they were and how/why they made art, meaning your essays will become far more complex and sophisticated when you come to write them. Here’s an example from studysthetics! It’s not laid out exactly how we plan, but study notes are all about how you learn, so feel free to mix up you you set your info out. As a general rule I recommend using dot points for your notes on the first two subheadings to make your study clear and concise. The third subheading is more about relationships the artist has with other things, so I found mind maps or flowcharts the most effective tools. The fourth point we’ll tackle in the next step, but generally how you lay out notes on artworks is up to your personal preferences! Because of just how much information there is on different artists, your artist study notes can end up becoming quite long. This means that for fast and easy study you’ll also want to create a super condensed version of your notes, which you can do by filling out this template! It gets all the basic info down so that you can use it as a kind of flash sheet, just don’t try to rely on it as the be-all and end-all of studying. Studying artworks by themselves is essential to your art study notes, but a lot of students fall into the trap of just describing the artwork – don’t! Whenever you’re writing about an artwork you have to remember that it’s more than a visual object. Artworks reflect the world, artist and audience around them and do so through the ways in which the work is made, what it shows and what it symbolises. It sounds like a lot to consider, but it’s actually just the frames and conceptual framework! As you study each topic/artist you will look at example artworks, so it’s your job to go into detail when you study them and create solid study notes that cover all aspects of the work, not just visuals! To do so break your notes into subheadings based on the frames and conceptual framework. Structural – what is the work made of? How is it made? What does it look like? Subjective – how does it make you feel? What is the mood of the work? Cultural – what era and society was the work made in? Does it show evidence of a specific culture? Postmodern – is the work an appropriation? Why and how? Artist – what does the work say about the artist? Is it a personal work for the artist? Audience – for what audience was the work made? How do audiences react to the work? World – how has the world/time and place of the artwork influenced it? Does the artwork say something about the world? By creating concise dot-point notes for each of these headings (about 5-10 dot points per heading) you’ll have an extensive set of notes in no time! The real focal point of studying any artwork is to make sure that you have enough information and detail to actually go on to write about the artwork. When writing your notes ask yourself, ‘Could I write an essay based on these?’. If the answer is yes – awesome job! If it’s a no then just keep working and expanding on your notes until you’re confident with them! It usually goes without saying, but just as a reminder; always put an image of the artwork with your notes on it! So many students just write their notes and then forget which artwork was which, so make sure to print out or link your notes to a copy of the artwork for future reference and to break up all your writing! That’s it! By going through each of these steps you’ll be able to create an awesome set of visual arts study notes that can carry you through the year and be an awesome asset when writing essays. The biggest thing to remember is that even though a lot of your art marks are based on practical work, the theory side of things is just as important. You don’t want to damage an awesome practical mark because you couldn’t remember who Van Gogh was! By writing frequent and detailed study notes you build up your knowledge and understanding of artists, art works, art style and even art history, which is all stuff that will help you write awesome essays and amazing extended responses come HSC. So grab a blank notebook or boot up a new word document and get to it!